“To be a successful farmer, one must first know the nature of the soil.”—Xenophon, Oeconomicus (The Economist), 400 B.C. Sometimes in late spring and late summer, when the fields of eastern Washington have been tilled for spring planting or recently harvested, a wind will build out of the west, gathering the loose loess soil of the dry fields, lifting thousands of tons of it into an ominous cloud that shrouds the region in a murk. The dust that grates in the eyes and leaves a dirty skiff on everything is a lesson in both geology and agronomy. The soils of eastern and western Washington, different as they seem and are, have one thing in common, as do most. They come, either by water or wind, primarily from elsewhere. Within the geologic timescale, most soils are very young. Within a human timescale, they are ancient. They also form a minute part of the earth in general, a fine thin skin. University of Washington geologist David Montgomery, in his recent book Dirt: The Erosion of Civilizations, describes soil as the “frontier between geology and biology.” Stressing how thin that frontier is, he compares it to human skin. Whereas human skin, at less than a tenth of an inch thick, represents a little less than a thousandth of the height of a person, soil accounts for barely one ten-millionth of Earth’s 6,380 kilometer radius. East of the Cascades, the loess soils of the Columbia Plateau and the Palouse, some of the deepest soils of Washington, are the result of the return of windblown silts, says Bruce Frazier, recounting the major geological events that created Washington’s diverse soils. Frazier, a soil scientist, recently retired from WSU where he spent much of his career mapping Washington soils. Southwest Washington is quite different, Frazier continues. Sedimentary materials interspersed with old basalt flows support mountain forests. Chehalis has a coal mine, he notes, highlighting the region’s much different geology. Much of the northeast soil is volcanic, the ash blown, again by prevailing winds, from the volcanoes of the Cascades, St. Helens, Baker, Glacier Peak. Northwestern Washington is dominated by glaciation. The urban corridor strung together today by I-5 is primarily glacial till, materials scoured and absorbed by glaciers, then deposited at the end of their travels when they melted. Craig Cogger, a soil scientist at Puyallup, continues the West-side narrative. Glaciers extended as far south as the middle of Thurston County, he says. When they retreated, they left behind a variety of soils. The glacial till soils are okay for agriculture, he says. But they have limitations. Their texture is coarse, so they won’t hold water. Whereas glaciers played a dominant role in the nature of Puget Sound area soils, there is also a marvelous diversity. Past eruptions of Mount St. Helens and Mount Rainier loosed huge mudflows, says Cogger, resulting in heavy wet soils interspersed with rocks—not suitable for row crops, but great for pasture and dairy. To the north, in Whatcom County, windblown silts, similar to the eastern loess, create fertile farmland. To the south of Olympia are older clay soils. The best agricultural soils of the Puget Sound region are in the alluvial river valleys, which collect the sediments from the erosion of the surrounding landscape and the Cascades. “When you combine the soil with the climate,” says Cogger, “you have some of the best farmland in the world. In geologic terms, those soils have been around for barely a whisper. The soils in the glaciated area are barely 15,000 years old. The soils of the alluvial valleys are just a few thousand. Alan Busacca gave up his academic career as a soil scientist several years ago to help people grow wine grapes, one of the latest and most lucrative manifestations of Washington’s agricultural geography. Within the soil cognoscenti, Busacca is perhaps best known for continuing J Harlen Bretz’s solution to the channeled scablands puzzle. It was Bretz who first understood that the strange Eastern Washington landscape known as the scablands was the result of an unfathomably enormous flood, or series of floods, toward the end of the last ice age. Building on the work of Bretz and others, Busacca gradually established that the upper layer of loess that forms the Palouse hills is the indirect result of those floods. After the floods scoured the existing loess that once layered the scablands, the silt settled out to the south, then was blown back up by the prevailing winds. And beneath that surface layer? More loess, more ancient soil (“paleosols” in the nomenclature), the results of two million years of prevailing winds. Busacca started out in geology, giving him a very fundamental understanding of soil formation, which comes from a combination of five rudimentary factors: parent material, climate, topography, time, and microorganisms. Parent material, the beginning of soil, is created from organic material or from bedrock through weathering, which happens through various physical and chemical reactions. The rate of soil formation over time is determined by climate. Busacca started working with grape growers in the mid-1990s, drawing on his understanding of soil formation and climate, which together determine what is understood as a site’s terroir, the personality of the site, if you will, the effect on the grapes determined by the same factors as soil formation: parent material, climate, time, topography, and microorganisms. Since leaving WSU to devote himself full-time to consulting and viticulture, Busacca has taken his fascination with terroir to its conclusion. He and winemaker Robert Smasne ’99 have developed a label of “terroir expressive” wine, Alma Terra. Using identical technique, they use syrah grapes from three very different vineyards to make three wines that express the terroir of their respective sites. The soils of the Minick Vineyard in the Rattlesnake Hills north of Prosser comprise a little loess over shattered basalt. The resulting wine yields red fruit flavors, a little cedar and spice. The soils of Coyote Canyon in the Horse Heaven Hills are 4-5 feet of loess over hardpan and basalt. Syrah from this site yields a blueberrry flavor with a medium body. The soil of the Ciel du Cheval vineyard on Red Mountain is windblown sand. Combined with its heat, wind, and drought stress, the site yields tiny berries with thick skins, an inky black juice with pleasing tannins and a blackberry taste. Terroir might not be as pronounced in wheat or peas as it is in wine grapes, but geography and the resulting soil types work together to give Washington an extraordinarily diverse agriculture and landscape. For Busacca, soil geography determines a region’s story of settlement and agricultural development. Washington, its agricultural diversity second only to the much larger California, is still discovering the potential and beauty of its geographic diversity, not only for wine grapes, but for the more than 200 other crops it grows. The sandy plateau of Horse Heaven Hills grows some of the best wine grapes in the country, but also carrots and a wide variety of other crops (see “In Season,” WSM Summer 2011). The alluvial soils and silts of the Wenatchee Valley and Yakima Valley have established Washington as the apple capital of the world. Cherries, pears, and other tree fruits love those same soils. West of the Cascades, the rich alluvial soils that Cogger celebrates have established the region not only for its berries and vegetable crops, but also for its huge seed industry. And then there’s the rich loess, blown in from elsewhere and just as apt to blow away. Karl Hipple, who was formerly Washington’s state soil scientist, is cataloging Washington’s soils in an online atlas, an ambitious task that one might not ordinarily associate with retirement. Classification and description of soil seems fascinatingly arcane to a novitiate. Even the general soils map of Washington, compiled by Frazier and Busacca, with its psychedelic mix of colors, only suggests the complexity that lies beneath (see web link opposite page). For example, Hipple describes the Palouse soil series, which are mollisols, as fine-silty, mixed, superactive, mesic, Pachic Ultic Haploxerolls. In spite of the dazzling array of soils, however, there is a logic. Perhaps the most useful approach to order is the soil taxonomy used in the United States and some other countries that was developed by the USDA. The orders reflect geography, climate and, to some extent, their use. Mollisols, for example, are generally associated with prairie and are some of the most productive silts in the world. Approximately 7 percent of the world’s soils are mollisols, says Reganold. But nearly 23 percent of U.S. soils are mollisols, reflecting the agricultural advantage the United States enjoys. “It’s not even fair,” he says. Whereas the orders reflect soil quality to an extent—aridisols, for example, form in hot desert areas—the matter of soil health is not that simple. A good definition of “soil quality” or “soil health” is tough to pin down. But all definitions include certain things, says USDA soil microbiologist Ann Kennedy: pH, soil structure, permeability, all the nutrients, all the chemicals, cation exchange capacity, and then all the things growing in it, the microbes, springtails, and nematodes. Even with awareness of the wild diversity of soils, however, one might understandably assume soils on a small scale would generally be homogeneous. Rather, says soil scientist Doug Collins, they are variable. Geography dictates variability even within a particular field. Not only does the definition of “healthy soil” shift from, say, vineyard to wheat field, conditions can be variable across that vineyard or wheat field. Increasingly, soil scientists and farmers are focusing in more specifically to determine proper agronomic practices that might vary over a field or farm. Whereas Collins, who is an extension educator for the WSU Small Farms Program, is encouraging small farmers to pay closer attention to their farms’ variability, some larger farmers are doing so already with technology. For example, says Benton and Franklin county extension educator Tim Waters, the agronomist for Mercer Canyons in Horse Heaven Hills pulls a machine across the fields that measures electrical conductivity of the soil. From this, he develops a map relating conductivity to soil fertility, allowing them to apply fertilizer with a variable rate spreader according to need. It is late April and unseasonably cold. We sit on metal chairs in a farm shop west of Dusty, a propane heater roaring in the background, as Michael Stubbs recounts his conversion as a farmer. “We’re direct seeders,” he begins. Still in a distinct minority, direct seeders minimize soil disturbance by planting directly in the ground without tilling. Although the pulling equipment has evolved dramatically, from mule to steam engine to crawler to 500-horsepower behemoths with 12 tires that can work a 60-foot swath, conventional tillage is much the same as it was when farmers first worked the prairie and shrub-steppe of eastern Washington in the late 19th century. Tillage is a hard habit to break. Any farmer will tell you, whether you’re trailing a mule team or riding in a climate-controlled cab, there’s a great satisfaction in looking behind you and seeing the furrowed soil you’ve just turned over. And the smell of the freshly tilled field is heavenly. There’s also a definite aesthetic appeal and matter of pride attached to a cleanly tilled field. On the other hand, tillage solves a lot of problems, which vary from site to site. Weeds are just one of those. The easiest way to get rid of a weed problem, at least temporarily, is to plow it under. Another advantage of tillage is it warms the soil more quickly, assuring earlier seed germination and growth. Soil scientists and direct-seeder farmers alike are frustrated with the slow acceptance region-wide of direct seeding. But all will admit it’s not an easy process. The long-established approach to tillage remains the norm for a reason. But tillage also destroys the soil structure that attuned farmers and other soil aficionados extol like a wine connoisseur talks about a wine’s body and structure. More dramatically, once disrupted, the soil more easily washes or blows away. In a paper titled “Erosion Impacts on the Palouse Misunderstood,” the late University of Idaho soil scientist Roger Veseth reported that since the Palouse was first cultivated in the late 1800s, all of the topsoil has been lost from about 10 percent of the cropland. Another one-quarter to one-third of the topsoil has been lost from another 60 percent of the cropland. Erosion rates of up to 200 tons per acre, or more than an inch of topsoil, have been measured on steep slopes, with a total of up to three feet of topsoil gone from hilltops and ridges. Ann Kennedy has been thinking for much of her career about soil microorganisms, about the extraordinary diversity of microscopic critters that make up a soil ecosystem. But lately, her thoughts have turned more to humus, to carbon, to organic matter. And so she has reached a conclusion. No organic matter, no microbes. No microbes? Well, without microbes, it’s not soil. It’s just a growth medium, something to hold the plants up as they feed on outside inputs. So suppose you want soil? How do you create more organic matter? 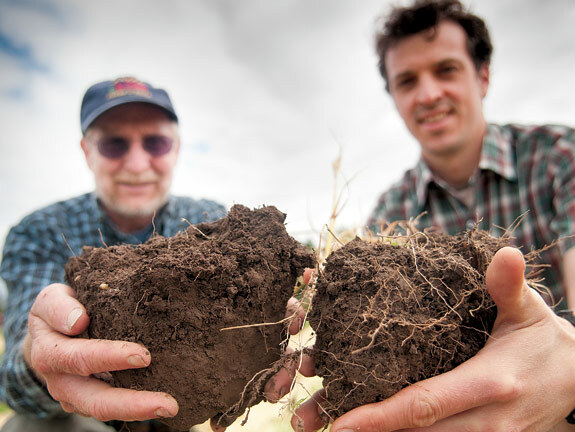 On no-till research plots at the Palouse Conservation Field Station, soil organic matter increased from 1.9 percent to 3.6 percent over 20 years. On drier plots near Ritzville, organic matter surpassed native levels, increasing from 0.9 to 2.5 percent. These increases are significant both for demonstrating how slowly soil builds even under optimal treatment and also for no-till’s soil-building superiority over conventional methods. No-till, low-till, direct-seeding are all similar approaches within the broader practice of conservation tillage. No matter what the term or the degree, however, their aim is to keep the soil as intact as possible and build organic matter. Even after 15 years of direct-seeding, Stubbs continues to “refine, build, change on that system. The learning curve is pretty steep. Especially under such dry conditions.” Stubbs’s land gets about 15 inches of rain a year. You don’t have to get very far into farming in its broadest sense to start noticing some contradictions. A particularly interesting one is the organic contradiction. There’s a lot to like about raising food organically, no synthetic fertilizers and pesticides, generally a friendlier approach to the soil. Some of the most interesting research, including that by John Reganold and Preston Andrews in horticulture, is showing high nutrient values in organic crops and in some cases yields equivalent to conventional methods. But attractive as it is, one of organic ag’s unfortunate little secrets is that it requires a lot of tillage, at least in field crops. Unless you’ve sired a dozen kids who love to spend their time pulling weeds, it’s hard to control weeds without herbicides or tillage. On the other hand, no-till or direct seeding requires a good amount of herbicides to control weeds. Even if the herbicides were completely benign, still, any farmer would just as soon give up the expense of applying what often are very expensive chemicals. Combining no-till and organic right now might be one of the holy grails of production ag. And it will remain an elusive holy grail for a while longer, because that is a very difficult thing to do. But it doesn’t stop Puyallup soil scientists Craig Cogger and Doug Collins from trying. They are working on using cover crops to out-compete the weeds. The basic idea is to direct-seed cover crops to grow over the winter. Then, at an appropriate time, you terminate them without chemicals, either by mowing or otherwise mechanically stopping their growth so they do not compete with the main crop. Nematodes are the most abundant multicellular animal on the planet, says Collins. Unless it has been fumigated or otherwise sterilized, all soil will contain nematodes. And they are amazingly diverse, says Collins. And because of their diverse roles in soil, they are excellent indicators of what’s going on in the soil environment. “The other beautiful thing about nematodes,” says Collins, “you can look at them under a microscope and tell what they do by the shape of their face.” For example, pathogens have a proboscis that they inject in the root or the epidermal cells of the plant. One-third of a cup of soil will contain between 2,000 and 12,000 nematodes. Some nematodes are bacteria feeders, some are fungal feeders, some are predators. Some nematodes eat other nematodes or protozoa, some are omnivores, and some are pathogenic. C. elegans, a bacterial feeder, can go from egg to egg-laying female in four days. The presence of predator nematodes, on the other hand, will indicate a more stable soil, as they take 14 months to go from egg to egg laying. Larger bodied nematodes, which correlate with earthworms, also reflect the degree of disturbance, as it takes a long time for them to complete their life cycle. As diverse as they are, nematodes make up only a fraction of the microbial life of a healthy soil. In a fascinating paper in Annals of Arid Zone, Ann Kennedy and Tami Stubbs ’89 (who is married to direct-seeder Michael Stubbs) review what is known and unknown about soil ecology. Much of this diverse realm, however, is still beyond our comprehension, simply because of the vast numbers. Kennedy and Stubbs cite one analysis of soil bacterial DNA that indicated the presence of 4,000 genomic types—reflecting a possible 40,000 species. Nematodes and bacteria, of course, are not the only indicators of soil health. The ultimate expression of soil health is our survival. From ancient Greece to Easter Island, as the soil goes, so goes the civilization. Washington’s inordinate share of rich soil and land area, combined with its rich agricultural diversiy and favorable climate, offer a relative guarantee of survival. However, the continuing erosion of the rich loess of eastern Washington and the locking away of equally rich alluvial soils of the west side beneath an impermeable shell should stir unease in anyone interested in the future of eating. Also, a growing dependence by the rest of the world on those relatively few rich agricultural pockets around the world and factors such as political upheaval and climate change preclude complacency. With Washington’s diverse geography, matched by awareness, appropriate agricultural research by a responsive university, and innovative agricultural practices, we can look forward not only to survival, but to continuing to eat and live very well indeed.